Darren McCauley's late equaliser all but sealed a Premiership play-off place for Inverness as Greenock Morton were denied a first win in seven matches. The substitute turned in Liam Polworth's low centre after the visitors had trailed from a winning position at Cappielow. Anthony McDonald finished a fine run with a curled shot in off the post. But Reece Lyon's composed strike and Greg Kiltie's penalty turned the match in Morton's favour before half-time. Kiltie's penalty came about when Brad McKay pulled Gregor Buchanan at a corner and the on-loan Kilmarnock striker could have had his fifth of the season for Morton later had his chip not been cleared off the line. Stand-in Caley Thistle goalkeeper Cammy MacKay deputised well for Mark Ridgers and made a great safe from Michael Tidser's first-half effort. John Robertson's Highlanders, who occupy fourth place, stretch their advantage over Dunfermline to nine points with three games to play, with the Scottish Championship's runners-up and third and fourth-placed teams progressing to the play-offs. Jonatan Johansson's Morton remain seventh - two points clear of Queen of the South and Falkirk and three above bottom side Partick Thistle. Greenock Morton manager Jonatan Johansson: "It's a very sore one and I feel for the players. I thought they fought excellently. There's no point feeling sorry for yourselves. We've got a massive game on Saturday against Falkirk. "It's a cup final for both teams. It's going to be a fierce battle. It takes a lot of character, it takes a lot of belief and it takes a lot of togetherness to get through it but on the performance today, I'm very positive and I'm very confident that we'll do it." Inverness CT manager John Robertson: "The penalty's a strange one because the referee had warned Gregor Buchanan twice about holding on to Brad McKay and yet he gives the penalty the other way. The same's happened in the other box and that's where managers and coaches get annoyed about the consistency levels. "I think we got the point that we deserved for our passing and play and keeping it going. Both teams deserved something. 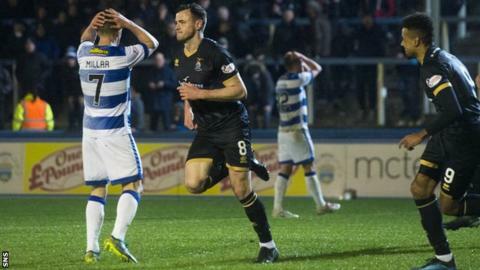 It's a good point for us and it could be a valuable point for Morton as well." Match ends, Morton 2, Inverness CT 2. Second Half ends, Morton 2, Inverness CT 2. Foul by Darren McCauley (Inverness CT). Goal! Morton 2, Inverness CT 2. Darren McCauley (Inverness CT) right footed shot from the centre of the box to the bottom left corner. Assisted by Liam Polworth. Kevin McHattie (Inverness CT) wins a free kick in the defensive half. Substitution, Morton. Andrew Dallas replaces Greg Kiltie. Kevin McHattie (Inverness CT) is shown the yellow card. Reece Lyon (Morton) is shown the yellow card. Foul by Reece Lyon (Morton). Attempt missed. Reece Lyon (Morton) right footed shot from outside the box is close, but misses to the left. Corner, Inverness CT. Conceded by Jim McAlister. Substitution, Inverness CT. Nathan Austin replaces Charlie Trafford. Substitution, Inverness CT. Darren McCauley replaces Aaron Doran. Charlie Trafford (Inverness CT) wins a free kick on the left wing. Corner, Morton. Conceded by Shaun Rooney. Substitution, Morton. Chris Millar replaces Gary Oliver. Attempt missed. Jordan White (Inverness CT) header from the centre of the box is close, but misses to the left. Attempt missed. Jordan White (Inverness CT) header from the centre of the box is just a bit too high following a corner. Corner, Inverness CT. Conceded by Jack Iredale. Foul by Gary Oliver (Morton). Jamie McCart (Inverness CT) wins a free kick in the defensive half. Substitution, Inverness CT. Tom Walsh replaces Anthony McDonald. Attempt missed. Gary Oliver (Morton) right footed shot from outside the box is close, but misses to the left. Reghan Tumilty (Morton) is shown the yellow card for a bad foul. Michael Tidser (Morton) wins a free kick on the left wing. Foul by Kevin McHattie (Inverness CT). Attempt blocked. Greg Kiltie (Morton) right footed shot from the centre of the box is blocked. Attempt saved. Kevin McHattie (Inverness CT) left footed shot from outside the box is saved in the bottom right corner.